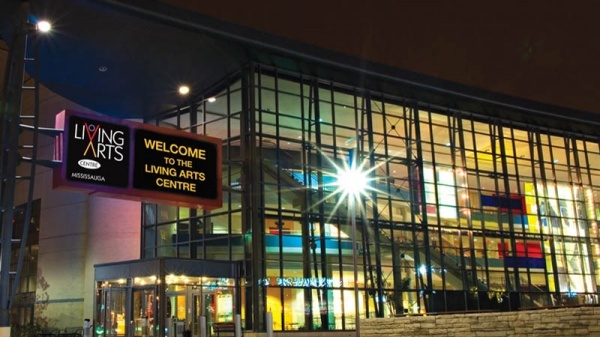 The Living Arts Centre is a 225,000 square foot (21,000 m²) multi-use facility which opened in Mississauga, Ontario, Canada in 1997. The Centre is visited by over 300,000 visitors annually, who come to view performing and visual arts programs, attend corporate meetings/conventions, or participate in a variety of community events.The Living Arts Centre houses performance theatres (Hammerson Hall and the RBC Theatre), an exhibition gallery, seven professional art studios, and corporate meeting facilities. The term living arts centre is often used as a synonym for gallery, especially for those venues which also hold multi-media presentations or teaching courses. The Centre has seven art and craft studios. Presently there is a glass studio, a furniture or wood studio, a textiles studio, a ceramics studio, a drawing studio, a metal studio, and a photography studio. When the Centre first opened there was also a digital arts studio. The Centre opened in October 1997, and is divided into two buildings that appear as one, the art and craft building and the performing arts building. The architect for the project was the Zeidler Partnership. There are three theatres: the biggest a 1,350-seat concert theatre called Hammerson Hall; a 382-seat recital theatre called the RBC Theatre; and a small 110-seat space named the Rogers Theatre. From Toronto: QEW west to Hwy 10 (Hurontario St). North on Hurontario Street to Burnhamthorpe Road. West on Burnhamthorpe Road to Living Arts Drive. North on Living Arts Drive. Or: Hwy 401 west to Hwy 10 (Hurontario St). South on Hurontario to Burnhamthorpe Road. West on Burnhamthorpe Road. North on Living Arts Drive. From Hamilton: QEW east to Hwy 10 (Hurontario St). North on Hurontario Street to Burnhamthorpe Road. West on Burnhamthorpe Road to Living Arts Drive. North on Living Arts Drive. Or: QEW east to Hwy 403 (by Ford Dr). East on Hwy 403 to Centreview/Mavis exit. Take Centreview exit to Duke of York. South on Duke of York to Rathburn Road. West on Rathburn Road to Living Arts Drive. South on Living Arts Drive. Click on the link below for directions, using TTC subway system to Islington Station or the GO train to Kipling Station, then transferring to Mississauga Transit (using the TTC subway system). The Living Arts Centre has underground parking for 450 cars with access off Living Arts Drive. The parking facility is equipped with pay and display machines that offer multiple payment options including coin ($0.25, $1, or $2 coins) and major credit card (Visa, MasterCard and American Express). Once payment is made, the machine provides a receipt (ticket) to be displayed on the dash of the car. Located on the ground floor of the Living Arts Centre adjacent to the elevators, LIVE offers diners an enjoyable experience with an exquisite taste of the arts. LIVE's main rotund dining area is surrounded by full-length windows, allowing natural light to fill the dining room during the weekday lunch buffet. By night, warm neutral colours and beautiful, dark wooden walls create an intimate setting for pre-theatre dining.